AzBaja.com, Home of the VW Baja Bug -:- Baja Forums -:- VW Volkswagen Bug, Baja, Bus, Sandrail and Thing -:- VW Volkswagen & Baja Bug General Discussion -:- Whatcha workin on? 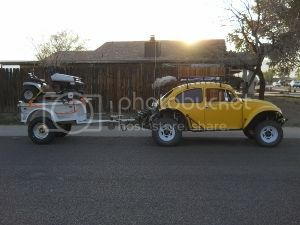 Baja Forums -:- VW Volkswagen Bug, Baja, Bus, Sandrail and Thing -:- VW Volkswagen & Baja Bug General Discussion -:- Whatcha workin on? Post subject: Whatcha workin on? So what's everyone workin on over this nice rainy winter? Personally I haven't had time to work on any of the VWs, been to busy trying to keep the daily drivers running. On a side note I did get a new daily: A 1989 Ford Bronco 2 4wd, 2.9 V6 and only 82500 original miles. Post subject: Re: Whatcha workin on? I have the old class 5 car torn apart to repaint a few things. However, this cold rainy weather has slowed my progress. finished lifting JINX, progress has been a little slow because of the cold. the car is in the backyard, bleed the new brakes some new tires and it will be a driver then I can start on bumpers and skid plates and a complete rewire. Sorry i missed the last couple of events, Life just gets in the way sometime. Car is running good for what it is. Been running up to Wickenburg via the Castle hot springs road then taking the Buckhorn rd around Buckhorn mnt into town. kind of an easy fun ride just to get some dirt time. Hope to see you in the dirt. back at you... "Hope to see you in the dirt"
Just installed new new spark plugs, a new belt, changed the oil, installed a new oil pressure switch and also found out that half the bolts were missing from the steering. I'll get new bolts tomorrow and hopefully it won't end up that the threads are stripped. working on the House, Trim etc. painting and floors next. It is almost done. Been working on my Pinball machines too. Will get to the Baja soon.